I recently completed my taxes and the chaotic process convinced me that I absolutely HAVE to get more organized when it comes to managing project expenses, home spending, and overall home project maintenance. I have files, data, receipts and spreadsheets scattered all over the house and really need all of that data collected, organized, and handy in ONE place. Cue angelic music and shine spotlight down on HomeZada! Have you heard of HomeZada yet? It is a FREE (and paid premium) online home inventory software and App that will help you protect, organize, and maintain your home. It truly is the answer to every homeowner’s home and property management needs. Click here to check it out for yourself! Read on to learn how HomeZada can change your life and revolutionize the way you plan for DIY projects! Do you remember the last time you sealed your granite countertops? Uh…not sure we have ever done that. Cleaned your air ducts? Um…six years ago? Cleaned out your gutters? Ah ha! This winter when they backed up costing us thousands of unnecessary dollars. Do you know how much your DIY projects are going to cost, and do you have an easy way to track expenses and project needs? Um… If an appliance breaks, could you easily locate your warranty and appliance manual? Errrr… And if a disaster were to occur, are you prepared to give the insurance company a detailed inventory of everything you own? Sigh. No doubt there are a bazillion details involved in running our homes, and chances are good that you need help managing all bazillion details. HomeZada is designed to handle the details! Everything from uploading important documents such as insurance policies, to creating home maintenance calendar reminders, to budgeting your DIY projects and tracking your expenses–it is all possible with this site. 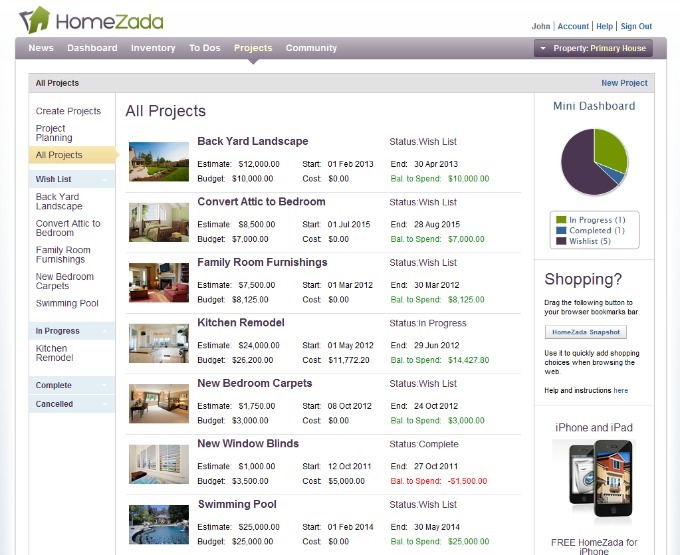 When you log into HomeZada, you will create your online profile customizing the areas which you want to focus on. 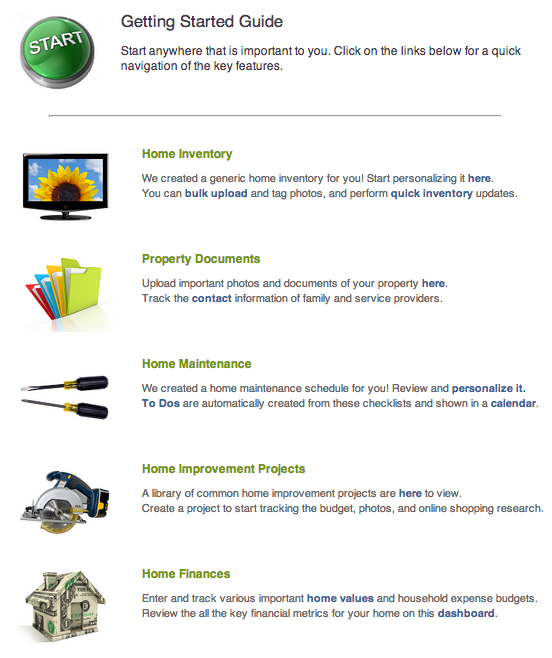 My favorite sections so far are the Home Maintenance and Home Improvement Project pages. You can activate the automated home maintenance schedule (with over 150 preset lists) to remind you to do all of the home maintenance items that you may currently be neglecting! Tip: I highly recommend looking over the home maintenance list just to familiarize yourself with everything you should be maintaining in your home! I have been a homeowner in the north for 13 years and never knew what an “ice dam” was until this year. Thousands of dollars of damage later, and I’ll never forget to remove snow and ice from my gutters again. You can also add your own “to do’s” and sync the home maintenance calendar with your other online calendars so that the list can be shared with the entire family. 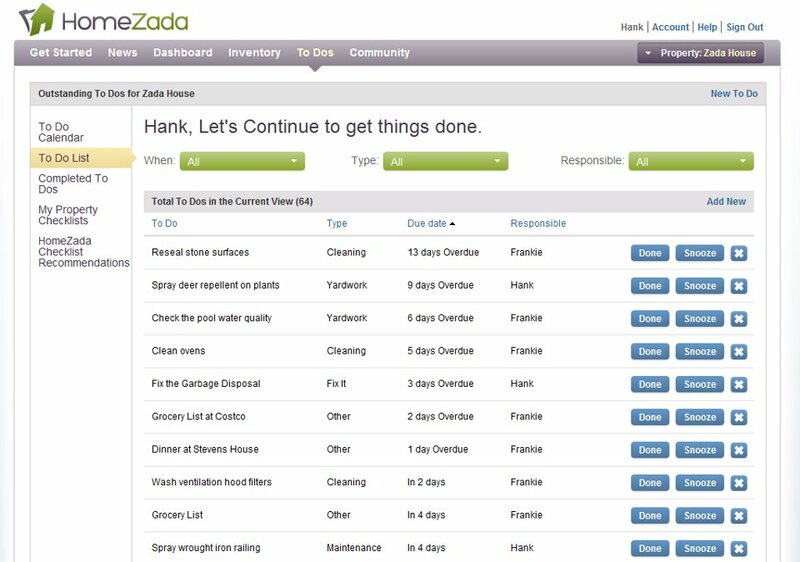 HomeZada also allows you to assign jobs to family members! Looks like Frankie and Hank in the example below better get a move on it! Home remodeling is fun and incredibly rewarding, but planning and keeping track of the materials and costs can be challenging. I am chronically redecorating every room in my home. It’s almost an illness at this point and considering what I see across the blogosphere I’d say it is highly contagious! 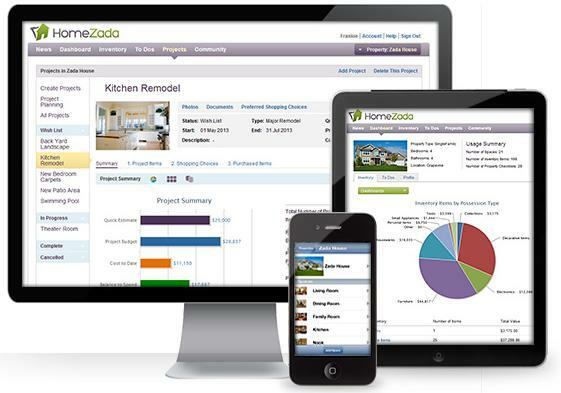 HomeZada’s Home Improvement Projects tool is awesome and can replace other home remodeling software you might be using. You can look up preexisting project templates that include sample cost estimates, suggested materials, and tips and videos needed for completing the project. You can also customize these items to fit your exact budget and keep track of purchases and costs along the way. If you’re out shopping, you can snap pictures of potential cabinet options for your kitchen remodel and store them all in the HomeZada app. 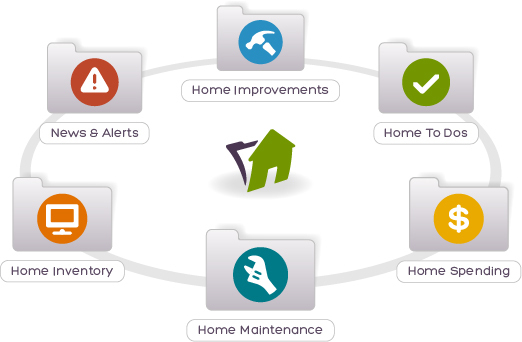 Whether you own a small home or several properties, HomeZada is your solution for managing your home. Anyone can sign up and try HomeZada for FREE. The free account features are incredibly helpful; however, if you want to have access to the home maintenance calendar, home improvement projects, and home finance sections you will need to sign up for a premium account. It’s only $5.95 per month with an optional annual billing of $59 per year. Let’s get organized and decrease our home maintenance stress! 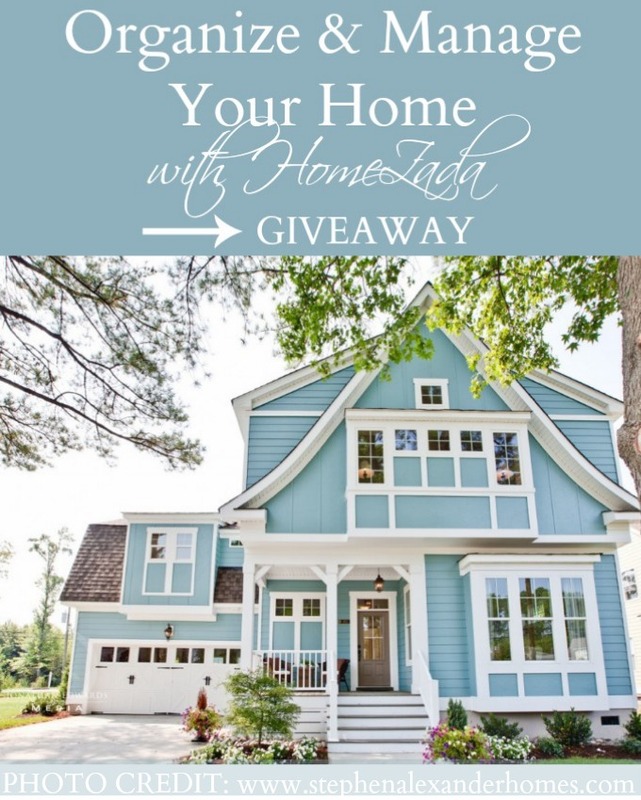 HomeZada is allowing me to give away 1 year free of HomeZada premium to one lucky winner. All you have to do to enter is follow the prompts in the Rafflecopter widget below. This post is sponsored by Homezada, as always, all opinions and statements are my own. I think the home maintenance checklist would be the most useful for me. Great giveaway, thanks for the chance. home inventory is such a good idea. The home maintenance calendar would be a huge help. Yes. lol Okay, if I have to say just one…the home maintenance calendar. I’m trying the free version but the premium definitely would meet all OUR needs! This is so cool! Definitely helpful!! The Home Maintenance is a perfect tool! I’ve really been meaning to do a detailed home inventory, so that would be the best place to start for me! Ooh..I need this. The home maintenance calendar looks great! I think the home maintenance will be absolutely the best for me! I can never remember when I did this or that. Anything to help with getting and keeping taxes organized for the year so I don’t have to figure it all out at once when taxes ate due. The home maintenance organization really speaks to me!! I’m in dire need of this stat!! I can always use some home organization. Pick me! The home maintenance calendar would be so helpful! This looks interesting — I’m looking into this right away! This is one of those mind-blowing times when you go- I didn’t know this was invented but it’s EXACTLY what I need! I can definitely use the organization of all of the different home spending categories. Very cool giveaway!